This tiny, 19th-century Soho institution prides itself on being London’s oldest French pâtisserie. Whether it’s still also ‘the best’ is neither here nor there: you drop by because it’s there, because it’s quaint and as far from corporate as can be, because it’s an old and familiar friend, or because it’s on the tourist trail. Hardly anyone uses the upstairs room, with habitués preferring to squeeze on to the pavement if weather permits, or to cram themselves by the old piano, surveying the memorabilia, peeling plaster and spangly swags of stuff while nibbling an almond croissant. Tea and coffee have no more caught up with modernity than the non-automated till; service is endearingly chaotic (asked if I’d like a coffee with my pastry, I was promptly presented with tea) and rather geared to the event order facility that ensures Maison Bertaux’s survival. Prices alone are in touch with current trends, but they seem a small sum to pay to ensure the survival of an icon. I think I can finally put my search for the best almond croissant in London to rest because the one I had at Maison Bertaux this afternoon was out of this world. I know I’ve mentioned that Aubaine had a pretty good one, on par with ones that I’ve had when I lived in Paris, but this was on another level. The Almond Croissant had the perfect ratio of almond filling to puff pastry. Most bakeries in London have too much puff pastry and not enough of the filling, making it just a croissant with some almond flavouring. This version had a generousserving of almond filling both inside and on top of the croissant. The filling on the exterior was baked well so it had a crunchy bite to it while the filling on the inside remained moist. I really liked that the filling wasn’t overly sweet. I was surprised that I was able to finish most of it because normally I’d feel a bit sick from all the sugar. It was garnished with powdered sugar and almond flakes sprinkled on top, as it this pastry normally is. An absolute delight to eat and would make a great afternoon snack, dessert option and breakfast! Next, we shared a Tarte Aux Fraises. This is also another typical French patisserie and came in a smaller serving but still large enough to share. It was made with the regular tart pastry filled with custard or crême patissière and topped with fresh and ripe sliced strawberries. I liked that this too wasn’t too sweet, seems like this bakery has got the level of sweetness just right for their baked goods! This is especially good because we shared quite a few items so it was nice to know we wouldn’t experience a heavy sugar rush after. This was also done really well – the tart pastry remained fresh and had no soggy bottom, the strawberries were naturally sweet and a lovely shade of red, and the custard was executed really well. A real treat to indulge in! Our third item was a Chocolate Choux Pastry. This was a choux pastry filled with chocolate crême patissière and glazed with a chocolate icing on top. It was circular in shape and cut in half so you could see the chocolate custard filling inside. Once again, it wasn’t very sweet and the chocolate used was dark so it contrasted well with the natural sweetness from the choux pastry and custard filling. I normally don’t like to eat Éclairs and any French pastry that’s meant to be filled with crême patissière in the UK because they tend to replace the crême patissière with whipped cream, which I absolutely hate. BUT Maison Bertaux stays true to the French recipe, making this dessert item authentic in taste and components. Being the foodies we are, we ordered another item as we were still eating the first three! We decided to go for a slice of the Apple Crumble Pie because it was actually the first thing we smelled upon entering the bakery/café and we knew that it had just been baked fresh. I believe it must be a popular item because there were two entire pies in the window and this was one of the few items that had more than one serving on display. This was an absolute delight as well! Yet again, it was not overly sweet and there was a great ratio of cinnamon apple filling to crumble topping to pie pastry. Each slice was also cut perfectly, without any filling spilling out, the crumble topping perfectly in place and a clean-cut on the pie crust, which is often difficult to achieve! This was served with clotted cream on the side but I found that the pie tasted great on its own, it truly didn’t need anything else. I came back a few days later with another friend for an afternoon tea snack and this time had the Pain Aux Raisins. I've also been on a hunt for an authentic pain aux raisins in London and this was not a bad contender. However, it didn't have any custard in between the swirls of bread/pastry. This is my favourite part of a pain aux raisins and an aspect I find is lacking in most of the ones I've had in London. In replacement, Maison Bertaux uses a citrus jam to keep the bread moist and actually isn't sweet either, just like their other items. This came in a reasonable size too and was dusted in sugar on one half, which I didn't think was necessary as the danish was sweet enough. The inside of the bakery isn’t very big, but their baked goods sure are! They had an amazing window display with a wide variety of pastries, cakes, tarts, and pies. It’s amazing to see the number of different items they offer and how they manage to make all of them (or at least the ones we tried) taste authentic and delicious! It takes true skills to be able to do that and I was simply amazed. The Danish Pastries are the best I have had in London. The selection of Cheesecakes thorough enough to cater for all tastes. The Quiche is uniquely theirs as are the Croissants, particularly the Ham & Cheese & the Almond. There are those who come here expecting some sort of modernism in terms of decor, crockery & service and they will walk away disappointed. Maison B is a place for people who understand the difference between a conglomerate set-up and an independent. An essential piece of Soho. What an intriguing setting. As soon as I walked in I felt as though I'd walked into a nan's living room that had clutter literally shoved into all corners. We asked for help on what the cakes were in the window and were met with a response of 'cream', 'coffee', 'fruit'. Let's just say it wouldn't have taken a quantum physicist to work that out. We ordered a choux bun with a coffee filling and an almond and apricot cake with some tea. Both desserts were delicious and the cake was beautifully moist. They definitely made up for the service and I would return to try the other desserts despite the dodgy decor. The tea was also good with a real depth of flavour. The prices were fairly reasonable. the kind of Parisian Patisserie you think exists only a few hours across the chunnel on Eurostar... and yet it's smack in the middle of Soho, where it has been since 1871 on Greek Street. Historicallny influential and has seen Mod, Punk, Alexander McQueen came and went... it's truly heavenly to visit alone or with friends. You'd want everything. E V E R T H I N G.
and I would let you discover the rest. Talk to Michelle the owner, she is adorable and will have a chat with you - sit by the windows next door or on the terrace and flirt with builders... or if you need privacy, go upstairs. 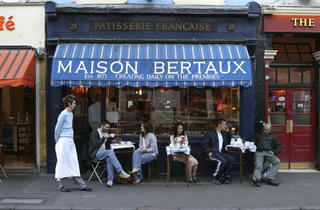 My friends and I visited Maison Bertaux for a Saturday afternoon treat. Such a disappointment...This quirky place looks like a dusty French 'bric-a-brac' where we can get a feeling of uncleanliness. They offer a various choice of pastries but I'm sorry to say that they are not as good as traditional French pastries. We had teas, two small eclairs/choux au chocolat, one mille-feuille, one slice of pizza. The pizza was fine but the pastries were tasteless and a bit stale. Tea cups were not clean and full of stains. I wouldn't recommend this place for tea time as it's overpriced for the quality of the pastries and the unfriendly atmosphere. This is one of my favourite London cake shops. 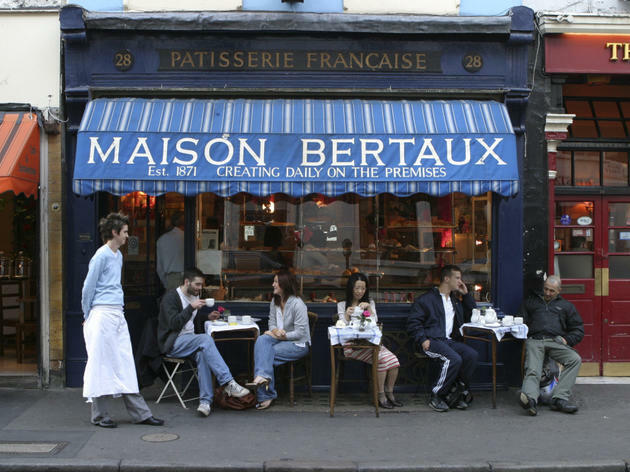 It is true that it has it's pitfalls, it's a little haphazard, the service isn't always amazing and it's all a bit cramped (and their card machine ALWAYS seems to be broken), but Maison Bertaux is a characterful London institution. The cakes are always top-notch and the higgldy piggldy nature of the place just adds to the charm. It's been going for years too and we should embrace independent places in Soho - there seems to be a slow stamping out of them! I think it's a lovely place to sit and have a tea or a coffee outside on the street and people watch. Plus I've also been to some of the events upstairs, which are always pretty fun. Very expensive £18.60 for 2cups of coffee and 2pieces of cake. I won't recommend anyone to eat there. Absolutely adore this cafe. Somehow reminds me of tea rooms in Withnail & I. Although 100% friendlier staff. Went to buy a yule log cake : very expensive charging £35 vs the other ones selling in other shops for much less (£25). It is also smaller than what I found in another chain. Bought on MOn for Christmas on Wed, sponge was a little dry for my liking, but the taste is good and another good thing is it isn't so sweet. I wouldn't return, good cake (but not excellent) and just too expensive. Would not recommend. Personally, I would not visit it again. Very high price for mediocre cake and disappointing coffee served in a crocked cup. The deco is shabby, faded and sad. The place is dying – literally!!! Disappointing, dated and un-cared for decor with grafitti on the woodchip wallpaper. Would not go here again although the owners were very friendly. The tables are wedges together on the first floor, making it impossible to get in & out without moving people around. Odd that orders are taken before you are allowed to sit down and no chance to think about what you want before being able to seat. Expensive cakes and coffees at comparable prices to places that have been kept up to date and clean (glass lamp shades with debis collected over many years), no heating and the toilets appeared dirty at passing inspection on the fast exit as we left this disappointing venue. fantastic selection of fine and traditional fresh patisserie! absolutely a unique atmosphere in its genre! so nice to have places like that in this busy and frantic and at time soulless city, especially when it comes up to coffee and tea shops! A unique place, a true gem to be treasured in the times of chain cake shops and cafes. I've been enjoying the lovely cakes, tea and coffee at Maison Bertaux for more than 15 years, and always bring my friends here. Lovely cakes and coffee. And i have never had a problem with the service. I used to study around the corner at the old St.Martins, and would pop in here to escape the frantic work load and rest for a little while... The Maison soon became a second home, and a place that made me feel like I was really living in the big smoke, at last. Walking around Soho now, it is hard to see the characters or find the soulful hangouts... except for a few remaining gems... and Maison Bertaux, for me, is one of those gems. A place to catch up with friends, make new friends, people watch, gather your thoughts, seek inspiration, always with a big pot of tea and maybe a cheese cake now and again... After every visit, I am thankful that soho still has some character under its belt! If you're looking for another capitalist conveyor belt service, go to Starbucks or Patisserie Valerie, if your longing for an authentic Patisserie full of charm, then my friend, welcome to the family and long live Maison Bertaux!!! Best café in London: fantastic cakes and pastries and personality. In a world of blandness and fake smiles, I relish their indifference to whether I like them or not. if you go for something different, it's fine but not the place for good food and service. pricey and totally not worth it. Lovely food. Very blunt man behind counter who ruined the atmosphere of an otherwise nice place. Went there yesterday for first time. Cakes were awesome, really top notch which is rare to find in London... Seating well there was plenty of it plus peaceful outside seating. Tea lovely, didn't try the coffee. Thought it was a great way to end the day. Not sure why its rated so low? Maybe a tad on expensive side and a tad grotty but this is soho!